Matt Schieferstein sends along an image of what appears to be an unlisted event item from Shinnecock Lodge #360. I recently acquired the patch included in the attached image on that auction popular site. I have exhausted my local resources to identify the patch. Any assistance would be greatly appreciated. 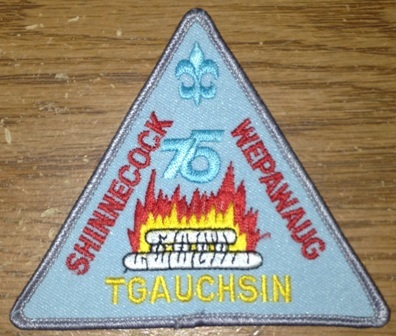 As you can see, the patch contains the number 75 which would make one think that this was an event issue from 1975. 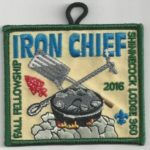 The patch contains the Lodge name and Wepawaug which was a chapter from Arcoon Lodge #369 from across the Long Island Sound. Tgauchsin: to be good, to be kind, to be meek, to be friendly, to be good natured. This would suggest a Fellowship or Conclave type event. Look familiar to you New England Collectors? Can anyone help Matt out? That doesn’t quite look to me like a 1975-era design… and that particular “75” seems to be a variation on the national OA 75th logo from 1990, but without the turtle on top of the “7” or the OA logo in the loop of the “5”.